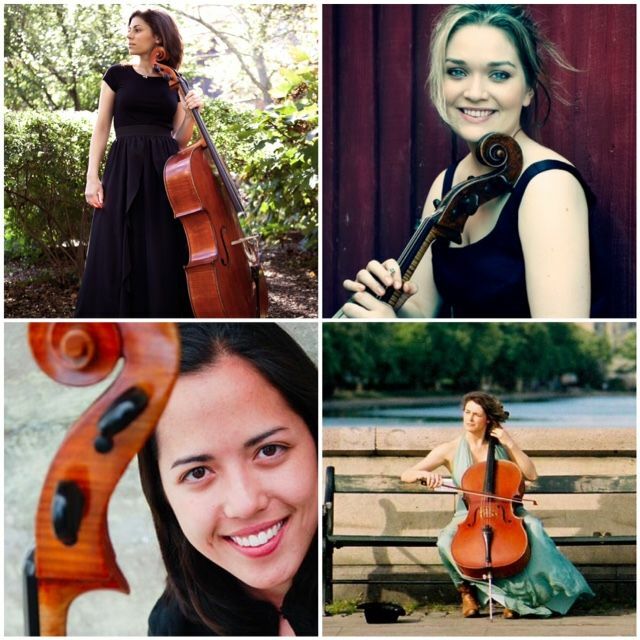 The Decoda Cello Quartet, clockwise from top left: Caitlin Sullivan, Saeunn Thorsteinsdottir, Claire Bryant, Hannah Collins. In a Bates concert at 5 p.m. Saturday, Jan. 16, four cellists affiliated with New York City’s Decoda Ensemble offer a program heavy on contemporary composers, including jazz bassist Ron Carter, but also featuring J.S. Bach and Maurice Ravel. Exploring themes of whimsy and images from the natural world, the Decoda Cello Quartet performance takes place in the Olin Arts Center Concert Hall, 75 Russell St. Admission is free but tickets are required: bit.ly/oacbates. For more information, please contact 207-786-6135 or olinarts@bates.edu. Playing a concert in Blue Hill, Maine, as well as the Bates date, cellists Claire Bryant, Hannah Collins, Caitlin Sullivan, and Saeunn Thorsteinsdottir are all affiliated with the full Decoda Ensemble. The artists of Decoda first collaborated with one another in the renowned Ensemble ACJW fellowship program, created by Carnegie Hall, The Juilliard School and Carnegie Hall’s Weill Music Institute, and they now extend that relationship as an Affiliate Ensemble of Carnegie Hall. Since its inception in 2011, Decoda’s projects have reached audiences in schools, hospitals and prisons as well as in prominent concert halls across the globe. Maurice Ravel: Bolero (arranged by James Barralet).